You can now order and manage SSL certificates directly from your billing portal without going through the trouble of having them installed for you via form. 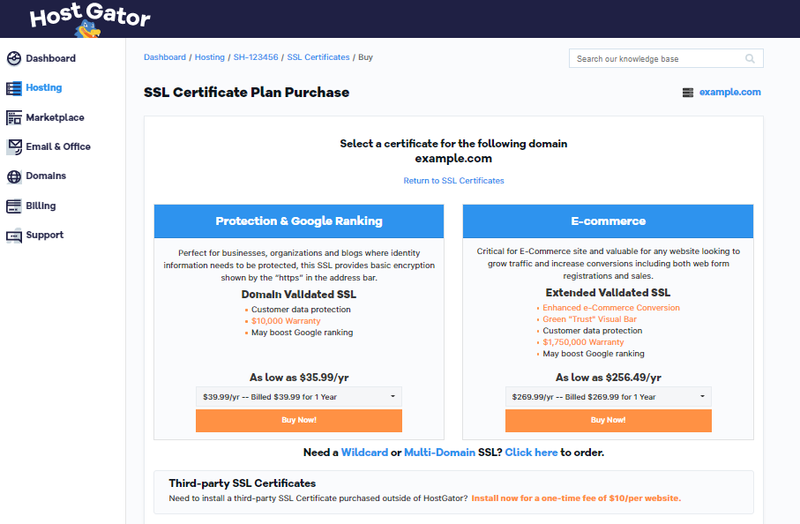 This is the fastest, easiest, and best way to order an SSL and have it installed. CNAME Verification: This method requires that your domain is using HostGator name servers at the time of verification. HTML Verification: This method will only work for websites that do not deny access to HTML files on your hosting package. Sites that deny access to HTML files, such as WordPress, may not be able to successfully install via this method. Email Verification: Only the primary domain on the account may verify with email verification. Any other domain will require an alternative method. If you are unable to use one of the methods above as outlined in this article, you will need to contact us via phone or Live Chat to purchase a Positive SSL. If you have our Business or Enterprise packages, the Positive SSL is free! 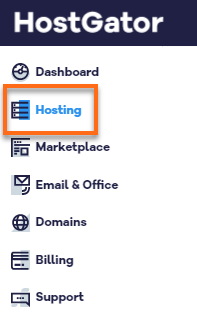 Select Hosting from the left-hand side menu. Select Manage for the hosting package that the SSL certificate should be added to. Provide the Certificate Information that will be displayed on your certificate. After paying, you will be redirected to your SSL tool page. From here you can see when the SSL installation completes and easily renew your SSL when it is time for it to expire. Note: Domains that are not using HostGator name servers will not . When selecting CNAME as your verification method, the process will automatically add a CNAME Record to your DNS zone on your cPanel. After successful purchase and after the record has time to propagate the service will automatically verify you with no extra steps on your part. If you are using HostGator name servers your domain will successfully verify even if your domain is not pointed to your server yet. 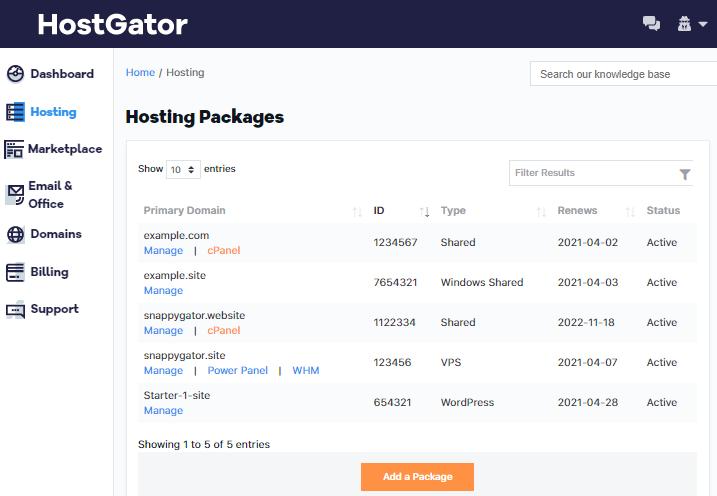 If you are not using your HostGator name servers you will need to find the CNAME record created and then recreate it at your actual DNS host. Click the advanced DNS zone editor. You can click Edit in order to expand full text areas to copy the information you need to create the CNAME record. After retrieving this information, you will now be able to create the CNAME record where your name servers are pointed to so that domain verification may complete. This may require contacting support for the service whose name servers you are using. Note: Email should only be selected with an SSL for the primary domain on the package. This option can be selected for other domains, but will not provide valid email addresses for verification. When you select email, you will need to select an email from the dropdown box to receive your verification email at. If none of the available email addresses exist, you will need to choose an address and then create the email address at your current email host to verify your domain ownership. After purchasing the SSL, an email will be sent to the address you selected with instructions for how to complete the domain verification process. Note: Websites that prevent access to HTML files, such as WordPress sites, will prevent this method from succeeding. When selecting HTTP, the process will automatically upload a file to the document root of the domain you selected for the SSL certificate after your invoice is paid. This may take up to 15 minutes before the file is generated. If your domain is pointed to your HostGator cPanel, then it will be verified automatically by this process. Users with domains pointed elsewhere will need to copy this file to the server where your domain is currently hosted. After identifying the correct file, please download it and then upload it to the document root of the server your domain is currently hosted at to complete the verification.